The National Statistics Institute (INEGI) has released the results of its inter-census study carried out in March 2015 which involved visits to more than 7 million households across the country. 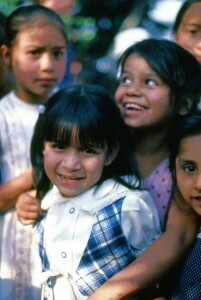 Children in Zitácuaro, Michoacán. Photo: Tony Burton. All rights reserved. Since 2010 the proportion of seniors (over age 65) has risen from 6.2% to 7.2% of the total, and the proportion of households headed by a female is up from 25% to 29%. The median age in Mexico is now 27 years. The youngest median age is in Chiapas (23), the oldest in the Federal District (33). Overall, Mexico’s dependency ratio is falling, continuing a period of “demographic dividend“. INEGI found that the number of households in Mexico is rising 2.4% a year and now totals about 32 million, giving an average number of 3.7 occupants/household. 98.7% of homes have electricity, 74.1% have piped water inside the building, a further 20.4% outside the building but on the property; 75.6% connected to drainage. Mexico’s most populated states remain the State of Mexico, the Federal District (Mexico City) and Veracruz, while the smallest states in terms of population are Baja California, Campeche and Colima. The most populated municipality is Iztapalapa (1.8 million), followed by Ecatepec (1.7 million) and Tijuana (1.6 million). The most rapidly growing municipality in the entire country is Pesquería, in Nuevo León, which has grown a startling 35.2% a year since 2010, mainly because of the new Kia vehicle factory opening there. INEGI did indeed find that about 1.4 million citizens (1.2% of the population) self-identified as “Afro-Mexican” or “Afro-descendant”, with significantly more women opting for the category than men (755,000 women; 677,000 men). It was no surprise to find that most Afro-Mexicans live in the states of Guerrero, Oaxaca and Veracruz. The survey showed that Mexico’s self-identified black population is not currently disadvantaged in terms of access to education and health services or work opportunities, putting it well ahead of Mexico’s indigenous population in that regard. Certainly more awareness of the long history of Afro-Mexicans is badly needed. For example, how many people realize that Blacks outnumbered Spaniards in Mexico until after 1810 or that Vasconcelas’ “Cosmic Race” (La “Raza Cósmica”) excluded Mexico’s African heritage? Want to learn more? A good place to start is Bobby Vaughn’s website Afro-Mexico or his Black Mexico Home Page, Afro-Mexicans of the Costa Chica, on MexConnect, which provide links to several of his articles including Blacks in Mexico. A Brief Overview. Is Mexico experiencing a demographic dividend? I would have liked to see the number of expatriates living in Mexico on a permanent basis. Thanks for the comment. Sadly, no reliable numbers exist for “the number of expatriates living in Mexico on a permanent basis”, though, for what it’s worth, INEGI data show that as of March 2015, there were just over one million people living in Mexico who had been born outside the country, with around 40% of these people holding dual citizenship. We have discussed some of the issues associated with trying to quantify “the number of expatriates living in Mexico on a permanent basis” in previous posts about foreigners living in Mexico.